What do you get when you combine two stellar Washington DC venues with a little New Year’s Eve magic? A supersized blow-out fit for nightlife royalty! 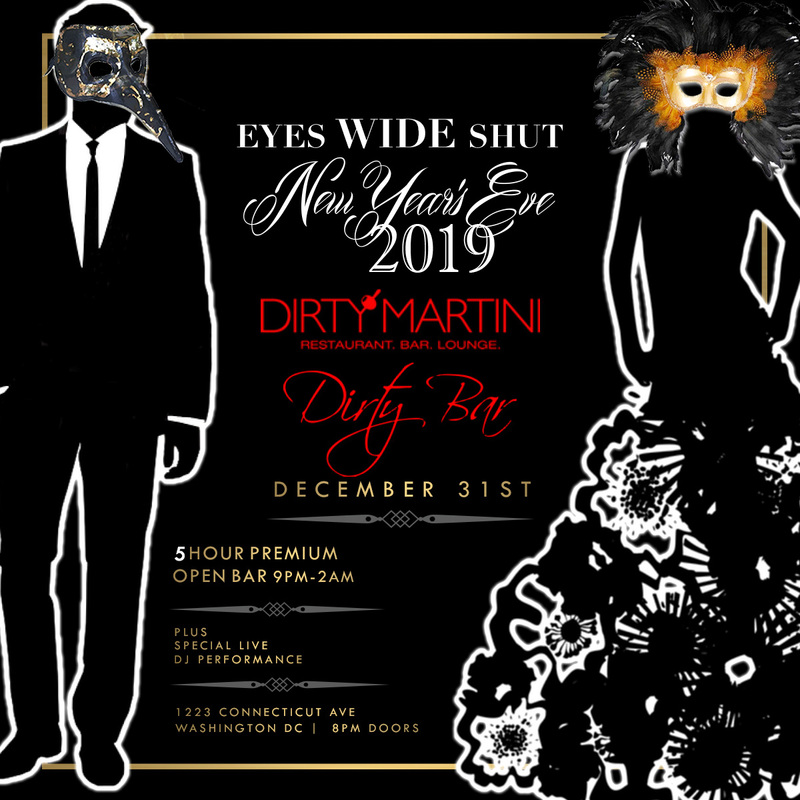 For one night only, Dirty Bar and Dirty Martini are teaming up to bring you the best New Year’s party that Downtown has to offer. You’ll be blown away by everything that Dirty Bar + Dirty Martini has to offer for this event. Start your evening right by securing an open-bar drink ticket, which grants you access to the selections of the five-hour premium open bar in both venues. Spend some time in Dirty Martini for the early evening light bites, or head up to Dirty Bar to take in the views from the heated roof deck. Live DJs will be pumping heart-pounding mixes of hip hop, house, and Top 40 mixes all night long, giving you plenty of time to explore the multiple dance floors. As the final moments of the year tick away, grab a glass of complimentary champagne and toast to the New Year with friends new and old. For the cherry on top of this delicious New Year’s event, snag a VIP package for luxurious amenities like bottle service, reserved seating, and more. Dirty Bar and Dirty Martini are staples of the downtown late-night scene, both located in a venue just off of Dupont Circle. The first floors hosts Dirty Martini, a contemporary cocktail lounge with sleek Italian design and dramatic high ceilings. An additional bar on the mezzanine level offers spectacular views of the excitement happening below. Above Dirty Martini sits Dirty Bar, a self proclaimed “modern speakeasy” with an impressive dance floor complete with in-house swings and a giant cage near the DJ booth for costumed dancers. The ornate space glow beneath warm lighting and a second bar on the heated deck will ensure that your cup will never be empty. Dirty Bar and Dirty Martini are a winning combination, so this is an event you won’t want to miss. This New Year’s Eve, you’ll get the best of both worlds at Dirty Bar + Dirty Martini. Snag your tickets for the best two-in-one party that DC has to offer. Make sure to bring your tickets and ID, entry will not be permitted without both. Note: This is a 21+ event. Doors open at 9pm. We recommend arriving early. Bottle service gratuity is a charge paid to the venue on the night of the event. You can pay with cash or credit card. If you want to purchase additional bottles you may do so the night of the event at the venue’s standard bottle pricing. Coat check is available at the venue and is a separate charge, payable with CASH ONLY. It will be cold on New Year’s Eve. While we will expedite everyone through the doors, you may have a short wait. We recommend wearing warm clothing. Coat checks will be available at all venues. New Year's Eve is one of the heaviest traffic nights of the year. Make sure you give yourself plenty of time to get to your destination! Taxis may be hard to find. We look forward to seeing you on New Year's Eve!